I’m a big proponent of savings, and apparently I’m not the only one. 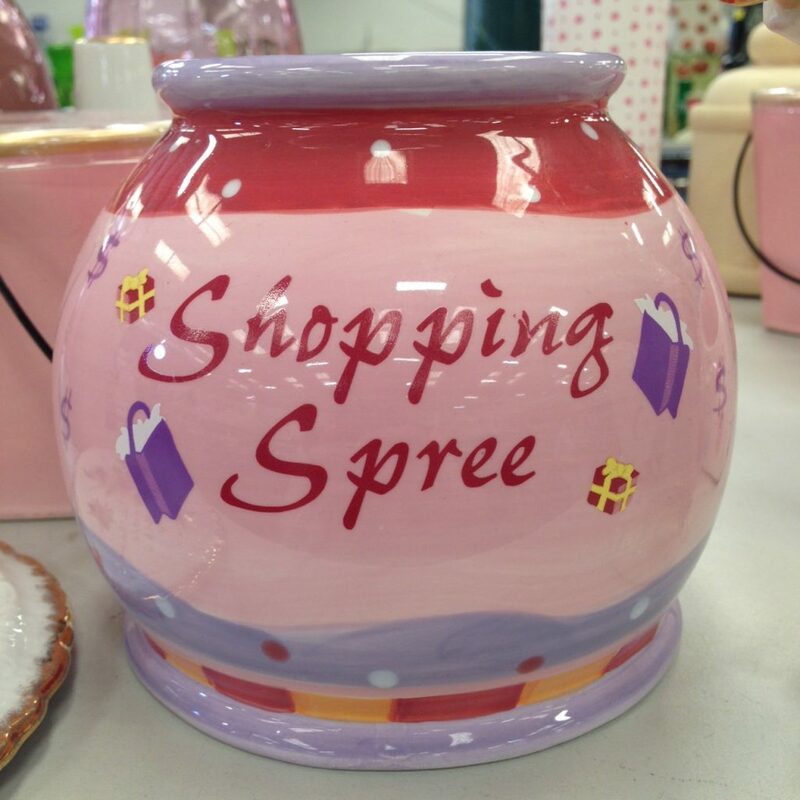 However, judging by the number of targeted savings banks that line the shelves of every thrift shop, few people actually want to save their money in a tacky novelty crock. I’ve written about them HERE, HERE, HERE and HERE. Whether it’s for a shopping spree . 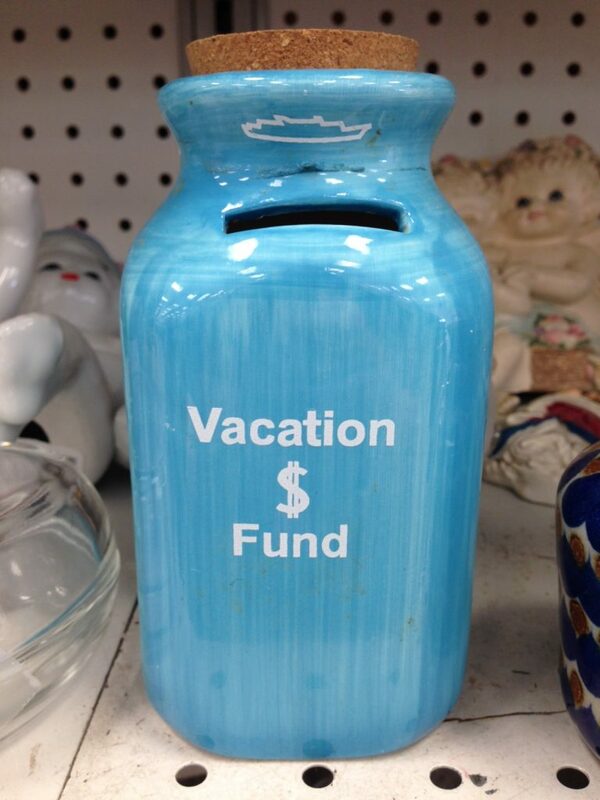 . .
A vacation fund . 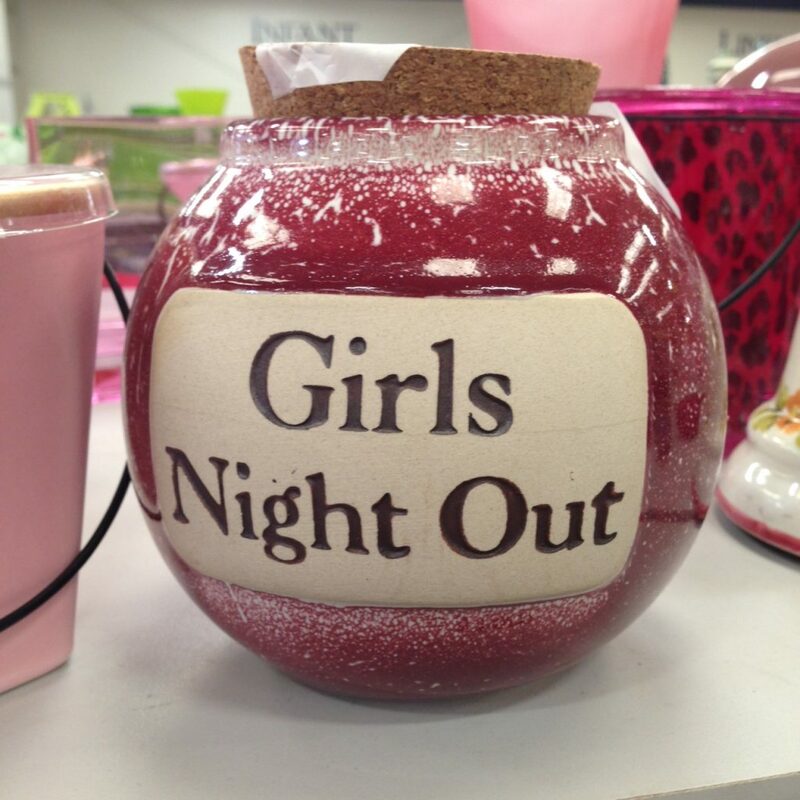 . .
Or a girls night out. You know . . . one without an apostrophe. Or an incorrectly placed apostrophe. 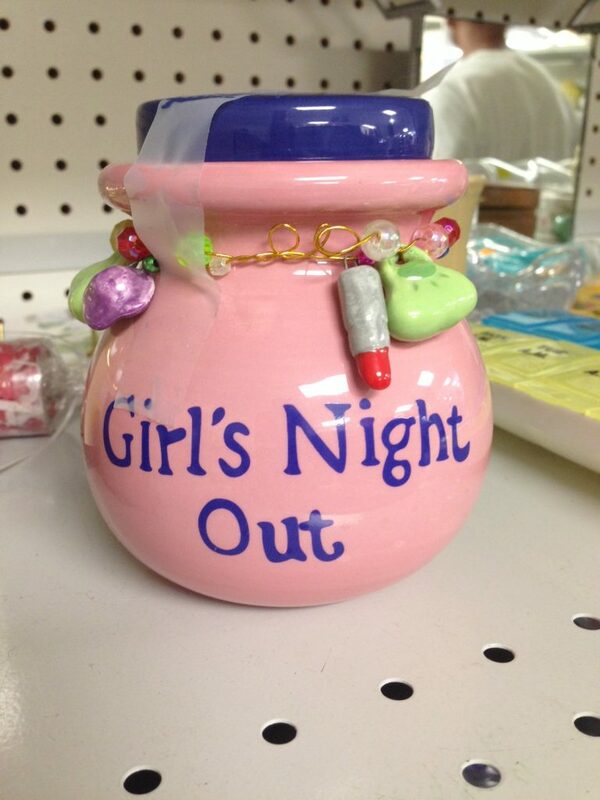 This one refers to one girl, a singular “girl” who who gets a “night out.” By herself. No wonder this bank was donated to Goodwill. Thank goodness that it’s possible to save in an actual credit union account. And that “girls” or “girl’s” or ahem . . . women can have a night out. 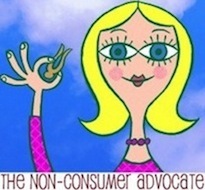 Without debt and without a novelty crock. I love these, because there are better containers. I save my coins in an old Jameson’s metal container. I think maybe you should ask your readers where they keep their change before taking it to the bank and what they plan on doing with that money. I consider it my vacation/fun money. I keep mine in a green TD Bank promotional bank… before that, I had a red Commerce Bank promo bank… TD took over Commerce Bank quite a few years ago. I always love to take the stash to the machine at TD to change the coins into dollars. Try to make it as heavy as possible between visits. I keep mine in a good ol’ canning jar! Me too. A quart size mason jar. I keep the money found on the ground and in the washing machine in an old wine jug. And that “found change” is MINE. Last time I used it to take my sister out to lunch. Any change I find goes straight into my thrifting-dedicated fanny pack, which also holds my coupons for the thrifts that issue coupons. (I think my late mother, who was a Depression baby and whose fanny pack it was, would appreciate this.) I’m with Katy about the ceramic crocks. Oh good lord, I actually have that last one hiding in the bottom of my nightstand! I wasn’t actually gifted the red Girls Night Out one years ago. No idea what I did with it. I am with Katy on apostrophes…..
That misplaced apostrophe would drive me crazy too. My thrift shopping partner — be it a friend or, on rare occasions, my husband — always gets an impromptu grammar lesson when we find one of those banks. Or a similarly specific mug or wine glass. Anything with misspellings or a misplaced/missing apostrophe, really! We have plastic coin roller thingies–husband puts coins in the right ones and I roll them when I notice they are full …..or overflowing, usually. I roll them, put a label with my account number on them (made on my computer with labels) and when I get enough to look untidy on the dresser top ($35 or so usually) I take it to the credit union. They give me free rollers and do not charge to redeem them. I deposit into savings usually—coinstar costs too much for the cheapskate! I keep mine in a container I bought at Goodwill. It’s not one like you show above, though. It’s a 1940’s Sunbeam mixer mixing bowl. 🙂 The contents might have to go toward paying property taxes this year. Ours is an old coffee can covered with a vintage drawing from dd’s younger years. The can holds $110. I use a mason jar but I use a lot of my change for purchases. I am the one standing at the register counting out $5 worth of quarters, nickels, and dimes even when I have paper money. Apologies to all who have to stand behind me! I have a friend who carries an old-fashioned change purse. She always pays with change. I think it is wonderful. She makes use of every penny. I am on a personal crusade against inappropriate apostrophes! For years my mother had a Sweden Bank…a Crisco can covered with a map of Sweden, her homeland. We added to it from time to time, but the trip to Sweden never materialized. I am sure she dipped into that bank to provide for her 5 children over the years and never raised enough for her dream trip. 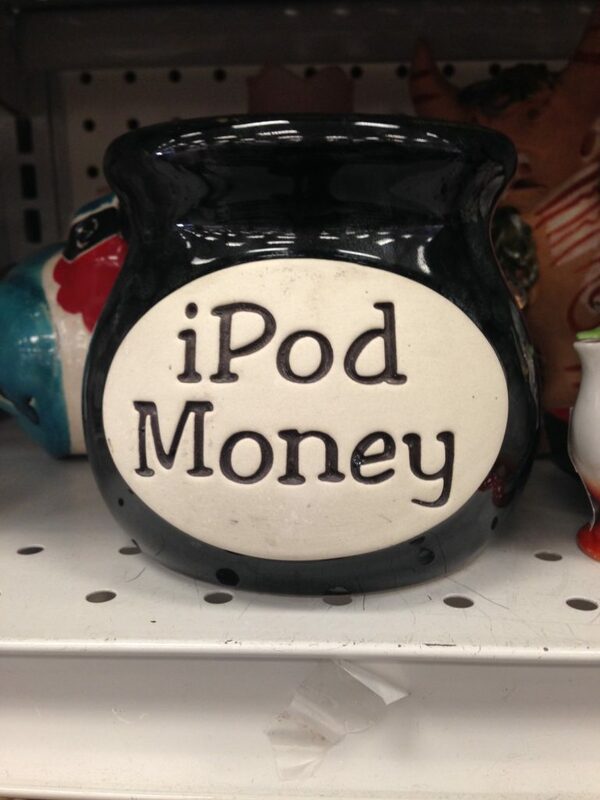 The “iPod Money” one gets me. Like, how many iPods are you saving up for? It seems so unnecessary lol! I think there’s value in having some form of a change jar in your house, but it doesn’t have to have a specified purpose. Growing up, our change jar was an old dill pickle jar. We would use the change to save up for Christmas presents. So while these little jars COULD be useful, it’s still better to save in a savings account, retirement account, or to invest. 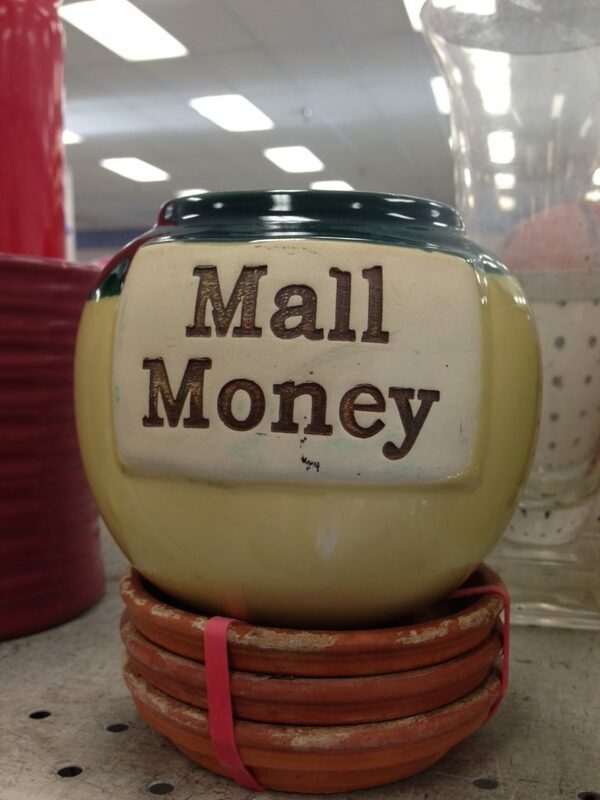 I am considering looking at my thrift store for a cute bank for my kids for Christmas. We would probably use them for some years and then we could yard sale them afterwards. I am also on the lookout for a thrifted piggy bank for my grandson who will arrive in February. Targeted adult banks are not my thing but I think a bank for small kids are a good early way to learn how save money. Any change I find, I put in my young daughter’s piggy bank. It’s an old-fashioned, pink ceramic piggy with rouged cheeks, twinkling eyes, and wearing a red polka-dot bow around its neck. Come summer vacation, I shake the coins out of it, and it’s “fun-money” for movies or treats. We have a change basket that sits on a shelf in the kitchen. I use it for yard sale spending money, usually can gather up $3 or $4 in change. I’ve purchased quite a few items this way over the summer that didn’t dip into our budget. Tell us about the book, JD. We use that fabulous book in our high school English department. It is both a great basic instruction and a review of correct punctuation use, and humorous to boot. I can’t tell you how many times I’ve seen signs printed professionally which have an unneeded apostrophe to make plurals. This one in a restaurant bathroom said, “Please throw towel’s away in waste receptacle.” I run around saying, “The towel’s WHAT?! What belongs to the towel? !” I have been known to take out a black sharpie and correct punctuation on signs. Drives me crazy to see these errors printed by professionals! I think one of the things Lynne Truss says in _Eats, Shoots, and Leaves_ is that she’s been known to pull out a black Sharpie from time to time. Her other great book is _Talk to the Hand_. Not surprisingly it’s about manners. In all my decluttering, those are two books that will always have space on my shelf! Argh. Must be tired. I messed up the title. It’s _Eats, Shoots & Leaves_. Damn commas. As someone says below, Lynne Truss, who is from England, wrote that book about grammar. She gives the rules and examples of the rules being broken in a very humorous way. The title is based on a joke involving the incorrect usage of a comma. I find it to be a very enjoyable read. Trying to reply to Bee — I missed! The kids each have a piggy bank for spent money and one for savings. We keep our “grown up” spare change in a Ziploc bag now that the small fish bowl we used to put it in is the home of our new fish! We use an old glass 5-gallon water jug for our change. We never fill it (I can’t imagine how we’d lift it if we did), but we’ve gotten up to $200 in there. The money usually goes toward extras (one year, a camera for a vacation, one year at my birthday $50 worth of Starbucks gift cards, etc.). We used to take it to our credit union’s coin counting machine and we could deposit it to savings for free, but now they charge 3.9%. So instead we cash it in at the Coinstar machine and exchange it for an Amazon gift card instead of paying the crazy 8.9% fee for cash. Too funny. I was browsing through a value village lately and saw a shelf with a bunch of savings banks. I immediately thought of you. We have a carved wooden box that my husband’s mom made for silver change, and the pennies go in a glass vase bought for a dime at a yard sale. Our son raids them for gas money every now and then. Otherwise it goes into savings. I use 2x Agee jars (like mason jars) – 1 for gold coins and 1 for others. Here in NewZealand we do not have 1c, 2c or 5c coins anymore, just 10c, 20c and 50c plus our $1 and $2 are gold coins. At the end of the day I put all my loose change in the jars. The first time I cashed them in was before a trip to Australia and I had $690!!! The other bonus is that when you find a coin here it will at least be 10c worth but unfortunately we are becoming a cashless society here – everyone uses eftpos. You know what’s weird? I almost never see these at my Goodwill. And we don’t have much in the way of those glass-beads-glued-onto-household-objects stuff that you do either. I used to post as Beth, but noticed a few others with the same name. It’s a fairly common name, which I didn’t consider when I first started posting…hopefully this moniker is a little more unique. I never see these banks at my Goodwill either. We keep our spare change in an old Coca-Cola tin that my husband has had since his childhood. When we got married, I just started putting my change in there too. Too bad no one ever made a jar labeled Spare Change. I might get one if the price were cheap enough. Next post: How Have You Cut Your Expenses?